During the raining season we are not able to carry out many of our normal fundraising activities such as selling or performing at the local market as this is closed. During this season we are also unable to harvest rubber so this is another income source we lose at this time of the year. Utilising the school holiday in October we would like to invite you to join us and over 30 children who will also be participating in a sponsored bike ride. All funds raised will contribute to the ongoing maintenance and running costs of the home. The running costs of the home are approximately 125,000 baht per month – our goal is to raise funds to cover the running cost of the home for three months. Please support our goal by signing up to join us and encourage your friends and family to sponsor you for this great ride. The ride will leave from Baan Dada on 18th October and will cycle to Thongphapum City where we will stay overnight at a local school. The next day we continue our cycle to the village of Ethong via the famous route which includes over 300 bends! We stay there for three nights at a nursery school where we will conduct our eye care program. During the eye care program you are free to explore this area or assist the team with the eye care program when needed. 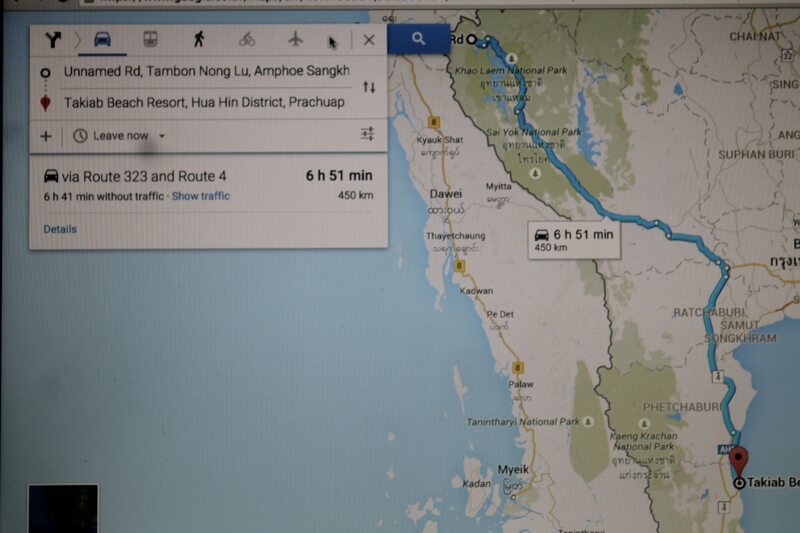 We depart on the 22nd October and cycle back to Baan Dada, covering a total of 160km. This fantastic route allows you to take in the beautiful scenery of this part of Thailand. All we ask is for a contribution of 5000 baht per day to cover the cost of the trip. If you have any questions then please contact us. If you are unable to attend the bike ride but still wish to support us you can make a donation on our web page. https://baandada.org/donate-to-our-home. If you would like to set up a cycle in your home country at the same time please let us know so we can support you. Please click the link to the online route map. This is a four day charity fundraising event by the children of Baan Dada starting on the 17th of October at Thongphapum and ending at a Temple by the beach of Huahin on the 20th of October. This fundraising event is in preparation for the school expenses for the 15 teens in the home who will be going to University or Technical School. We hope you can join us and help fund raise for the further education of these 15 kids. On the third day of the cycling, the 19th of October, the rest of the children at the home and student volunteers from Singapore (hopefully they can come) will meet us in a temple somewhere in Ratchaburi… Then, the next day we will go together to reach our final destination at a temple in Huahin. Once we are at the temple by the beach in Huahin, we’ll rest and enjoy the sea for 2 days before going back home on the 23rd of October. Baan Dada has held Cycling for Education event each year since 2012! In October 4, 2014, 8 children from Baan Dada Children’s Home, Boonmi, Ekachai, Dajae, Kamput, Eh, Mongkon, Pithu, Tasada as well as Dada Ramakrishna, Dada Prashanta and two volunteers took part in an intense, endurance bike ride to raise money for university tuition and accommodations for the upcoming school year for 10 children from Baan Dada and surrounding areas of Sangkhlaburi. As a true test of endurance, riders stopped only for food and to use the toilet. Cyclists rode 150 km from Baan Dada Children’s Home located outside Sangkhlaburi, Thailand. 7,400 USD out of 13,035 USD needed was raised through the cycling event! In April 2013 Cycling for Children’s Education event raised money to pay school fees for 50 children studying in elementary and secondary school. Dada Ramakrishna, Fa, Malai, Yada, Mayuree, Johnny, Ramesh and volunteers Carl, Erin, Weiliang, Lim Yi and Dao, cycled from Kanchanaburi to Phuket in 4.5 days, a total of 895km! We stayed in temples and cheap guesthouses along the way. We were able to raise a total of 122,000 baht on road after expenses! Baan Dada has held Walk for Education event each year since 2010! The 2014 Walk for Education event of 39 km from Baan Dada Children’s Home to Three Pagodas Pass began on 13th April. See the Flyer 2014 in Thai or in English. In October 2013 walk participants walked from Sangkhlaburi to Kanchanaburi (218km) to raise money to pay school fees for 50 children studying in elementary and high school. There were 17 children participating, ranging in ages 10 – 15 years, along with Dada Prashanta. There were also five volunteers, along with 12 school students and two teachers from Singapore who completed the walk. We stayed in schools along the way and cooked our own food. We completed the walk in four days in relay style and spent two nights camping at Erawan waterfall having some fun. We were able to raise US$7,500 on the road after expenses!!! Dada Ramakrishna has done Solo Cycling for Education each year in September since 2012! In his 2013 Solo Cycling for Education he cycled from Kanchanaburi (Thailand) to Singapore (yes, Singapore!) in hot and rainy weather. The journey took him eleven days and he covered 2,027km. This event raised money to cover university fees for eleven children for the second semester school that opened in October 2013. By raising this money, Baan Dada can ensure that these children can continue their studies which are so important to their future. Going side by side with the 2012 Cycling for Education event, the Children’s Live Music and Cultural Dance fundraising activities were arranged at Koh Phangan. It began on 11th April, 2012 and was a 12-day event organised by Katie and Steve Cumbers. It included live music and cultural dance performances by the children. This event was a great success and all of the children had an amazing time!